Welcome to our live coverage of the battle for second place in Group B at the 2016 COSAFA Under-20 Championships between Swaziland and Lesotho at the Mogwase Stadium on Monday. Lesotho XI: Jessy Matsie, Itumeleng Leche, Mohai Mohai, Rethabile Mokokoane, Khubetsoana Kamela, Lehlohonolo Fothoane, Monang Mohapi, Moalosi Mosoeu, Tseliso Botsane, Rasetabele Kalosane, Thabang Malane. Swaziland XI: Mlamuli Lukhele, Junior Dlamini, Vusumuzi Vilakati, Nunu Shabalala, Eugen Mdluli, Saviola Gamedze, Ali Matse, Mduduzi Mabuza, Bongwa Matsebula, Sihlongonyane Palma, Mzwandile Kunene. FULLTIME: Lesotho take the victory over Swaziland with a 2-1 success! 82′ – Yellow card to Lesotho’s defender Mphosi for a crude tackle on his opponent. 81′ – Lesotho sub: Malane of Lesotho out for Katlego Tatai. 79′ – Ranalefane is called to duty for Lesotho. Closes the near post angle to punch out a shot from Ali who arrived in the box to meet a free-kick from the right. 74′ – Lesotho sub: Goalkeeper Matsie lies down injured. He receives treatment and the match is stopped. Substitute keeper Monaheng Ranalefane eventually comes in to replace Matsie. 69′ – Botsane drags his effort marginally wide off the near post. It is yet another counter-attack for Lesotho. 59′ – Swaziland subs: Shabalala and Matsebula out and in comes Mthembu Bhekani and Menzi Lukhele respectively. 57′ – Yellow card to Botsane of Lesotho who defies the offside whistle to shoot into the net. 52′ – Leche comes close to adding the third but Swaziland keeper Lukhele does well to keep out the ball as it was about to sail in through the far right top corner. 48′ – GOAL! Khubetsoana Kamela scores with a powerful shot inside the box. Lesotho in front! 46′ – We are back under way in the second half. HALFTIME: The first half flies by and it’s a balanced affair. Swaziland started strongly but soon the reality of playing counter-attacking opposition caught up with them. 44′ – Lesotho sub: Mokokoane out, Relebohile Mabone comes in. 42′ – GOAL! Lesotho finally get their equaliser! Thabang Malane chips a long range ball from the right into the top far left corner. An absolute beauty for the football archives. It’s game on. 39′ – Swaziland goalkeeper Kunene tries to be fancy with the ball which slips from his palms to gift Lesotho striker Kamela a free shot in the box. Fortunately, the keeper gets back on his feet to block the ball which defenders eventually clear. 32 – Nune Shabalala nearly punishes Lesotho on the counter-attack, but his low effort across the goal mouth is within the range of diving Lesotho goalkeeper Jessy Matsie. 26′ – Malane tests Swaziland’s defence with a dangerous diagonal ball in the box but the ever busy Vilakati heads the ball away backwards. Safety first. Swaziland should be wary of Lesotho’s counter-attacks. 22′ – Mosoeu breaks clear on the right but once again skies his effort for Lesotho on the break. The action is now balanced but Lesotho have sent substitute players to warm up. 19′ – Botsane for Lesotho charges forward into Swaziland’s half via the right wing, but is thwarted before he shoots. Lesotho have opted to play a counter-attacking game. 17′ – Lesotho launch their first meaningful attack. Botsane sends the ball in the channels for Kamela to chase, but Swaziland defender Vilakati clears the ball away. 12′ – Lesotho goalkeeper Matsie reacts the fastest to make a save after Matse is given acres of space to head the ball in the box. 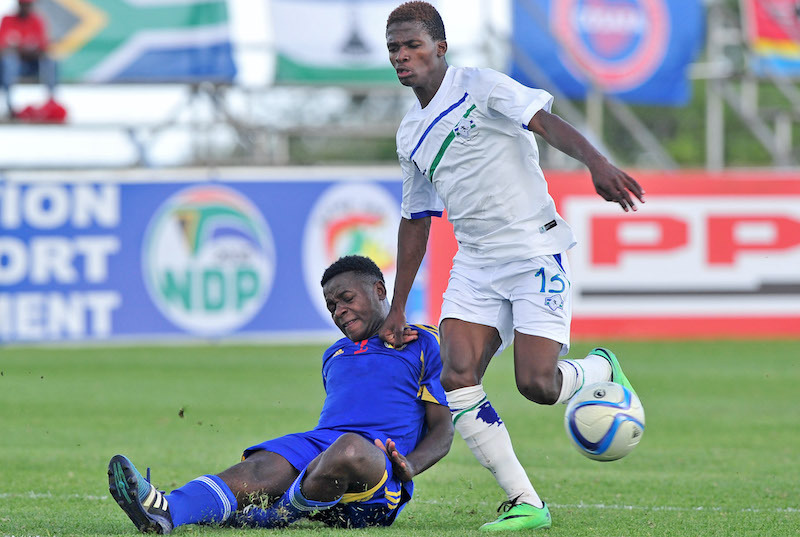 7′ – Moalosi Mosoe of Swaziland goes down after clashing heads with Vilakati. He receives treatment but is back on his feet. 5′ – GOAL! Saviola Gamedze puts Swaziland ahead, bundling into the net a sweeping low ball from Ali Matse, who had zigzagged his way into the box from the right. 1′ – We are under way in the match between Lesotho and Swaziland. – The referee for today’s clash is Stanley Hachiwa from Zambia.